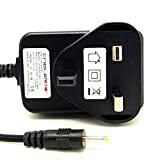 This is a high quality branded CableRite mains power adapter which works in harmony with this model. The type of adapter is the switch mode variety which is lightweight, accurate and provides stable 6 volt DC power supply. It will work up to a max demand of 1 amps, but will also replace lower rated power adapters with the same voltage such as 0.75a , 0.5a, 0.3a etc..